This is the first true Carnival Digger. It was designed by carnival man William Bartlett following World War One, and patented in the U.S. and Canada in 1932. It was never offered for sale to other operators. These diggers were operated with great success from the mid-1920’s until 1951 traveling with major carnivals in the U.S. and Canada. Employee-agents (associates), were hired and trained by Bartlett to operate carnival concession units of 12 to 16 diggers each. 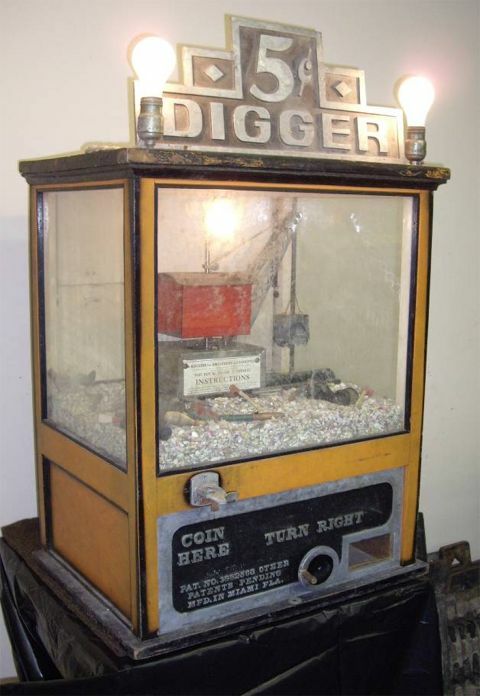 The awards offered to the players as prizes were coins (nickel coins, and on up to silver dollar coins), and the games were known in the trade as “Nickel Diggers”. At the time of Mr. Bartlett’s death in 1946 he had over 40 operators in the field supplying digger concessions to all of the major carnivals of the day. Bob Parker continued this business operation successfully, acting as the manager for the estate of Mr. Bartlett, but the end of U.S. operations came abruptly in 1951 with the implementation of a new Federal anti-gambling law known as the Johnson Interstate Transportation Act. The Bartlett type of digger, and all others which were powered by an electric motor, were illegal to cross state lines from 1951 until the mid-1970’s. Some of the Bartlett/Parker type Nickel Diggers operated for another 20 years in Canada, but they were finally closed-down for good by the Royal Canadian Mounted Police in Edmonton, Alberta in July of 1975 on the grounds that they were gambling devices. This surviving Bartlett “Miami” Digger is an excellent example of the true original “Carnival Crane”.